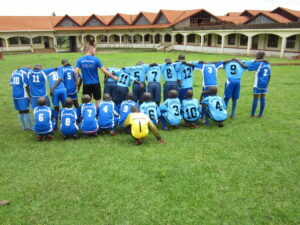 In order to lift the standard of sports in Kimbilio, we would like to recognize the effort of our international partners from Germany under the leadership of Uncle Jakobus who saw the need of shaping our young children in the area of sports, as this can help some of them to have a bright future. 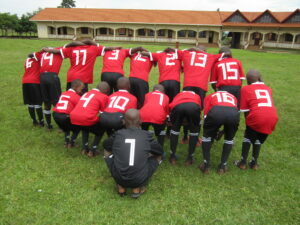 They brought the children brand new uniforms as you may see in the pictures. These sets of uniforms were given by two different people as per the color, that is a lady and a man that you see in the photo. Among the materials received included; full uniform pairs,socks and some balls. This motivated and attracted more children to start admiring and participating in sports because they assume there is no difference now between them and other international teams like Arsenal, Manchester United, Barcelona among others. I want to assure our donors that their donation was not in vain but actually our children have been excelling up to District and regional level. This means if more trainings and effort are put in place, we shall hope for the best in future. 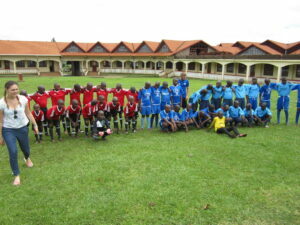 After receiving the uniforms, all the two teams had to go for a friendly match that very day while our sponsors were still around. Both children and all Kimbilio staff were so much grateful to God who used the donors to give in that and we continue to pray that God will continue opening more blessings for them in all they are doing. However, in summary we would like to notify you that in case you would love to be part and partial of this kind of blessing by giving in any thing to up lift these children’s talents, please you are most welcome.